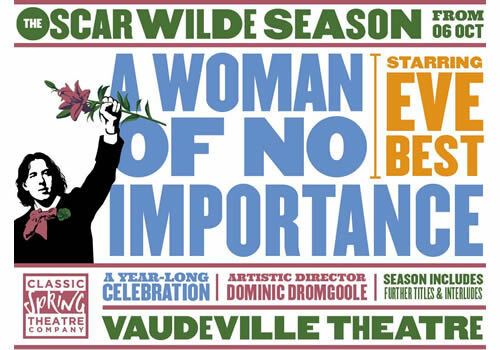 Olivier Award-winning actress Eve Best stars in Dominic Dromgoole’s brand new production of Oscar Wilde’s comedy drama A Woman of No Importance. Presented as the first in a series of plays that form an ongoing Oscar Wilde Season at London’s Vaudeville Theatre, the season is the first venture from Dromgoole’s new theatre company Classic Spring. One of Wilde’s seminal plays, A Woman of No Importance follows an earnest young American woman, a disreputable English Lord and a naïve young man as they attend a bizarre house party, packed full of fools and grotesques. Close by, a woman lives alone, harbouring a deadly secret. A witty drama about survival and reputation, the play promises to be wildly entertaining. After an acclaimed turn in Trevor Nunn’s Love in Idleness at the Apollo Theatre, Eve Best returns to the West End stage to take on the lead role. Further stage credits include A Moon for the Misbegotten, Much Ado About Nothing, Anthony and Cleopatra and an award-winning performance in Hedda Gabler. Further casting includes Anne Reid, Eleanor Bron and William Gaunt, as well as Emma Fielding, Dominic Rowan, Crystal Clarke, Harry Lister-Smith, Sam Cox, William Mannering, Paul Rider and Phoebe Fildes. Originally premiering in 1893 at the Theatre Royal Haymarket and last seen in London in 2003, A Woman of No Importance returns to the stage to play a limited season as part of a season that celebrates the ground-breaking work of proscenium playwrights. Further plays in the season include Lady Windermere’s Fan, An Ideal Husband and The Importance of Being Earnest. Directed by Dominic Dromgoole, former Artistic Director of the Globe, A Woman of No Importance plays at the venue from October 6th to December 30th 2017. A Woman of No Importance may not be suitable for young children.